Learn to Get Rid of the Bully Air Potato! Air potato is an invasive vine that is everywhere in South Florida. If you leave your backyard unattended for a couple of months, there’s a good chance when you return you might see the weed popping up. Once established, it is tough to control and it just won’t stay out. 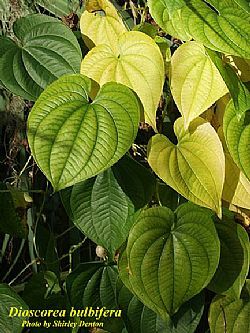 Air potato can quickly engulf native and landscape vegetations, climbing high into the tallest of trees and palms. For this reason, Lee County Extension is sponsoring an Air Potato Control and Management Workshop. Staff will show the best management strategy and how you might be able to obtain your own air potato-eating beetles. The speakers are researchers from USDA, Florida Department of Agriculture and Consumer Services (FDACS) and Lee County Conservation 20/20 program. When: 10 a.m.-12:30 p.m., Friday, Aug. 15. UF/IFAS Lee County Extension agents offer educational services through a three-way cooperative arrangement between the Board of County Commissioners, the University of Florida and the U.S. Department of Agriculture. Local extension agents are off-campus faculty members of the University of Florida. For registration and more information, visit the link below or contact Stephen Brown at gardenclasses@leegov.com or (239) 533-7513.